For thousands of employees of Toyota Motor Corp., sports has always been a unifying force, something to bring together workers from all facets of the huge automaker. But never has the power of sport been more evident than in recent years, when the nation has been tested by the global financial crisis and the March 11 Great East Japan Earthquake. On May 20, 28 members of Toyota Motor’s women’s softball team visited a factory that was damaged by the quake. 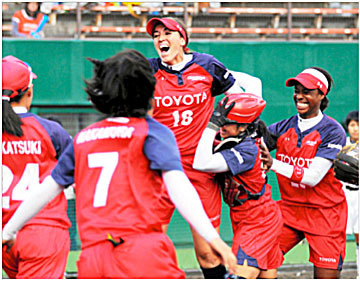 Toyota Motor’s softball team had won the Japan Softball League the previous year. Among the members who visited the factory that day was Monica Abbott, a member of the U.S. softball team that won a silver medal at the 2008 Beijing Olympics. Toyota Motor alone, the parent firm, has 638 athletes playing on 35 sports teams, such as rugby and baseball. Including the entire group, Toyota is one of Japan’s largest sports groups. What’s interesting is the reason Toyota Motor has so many athletes. The globally renowned automaker already has widespread name recognition and a positive brand image. What it seeks from sports is more of an intangible element. There isn’t much else other than sports that can create a sense of unity among more than 300,000 employees working for group firms, both within and outside of Japan. The president himself is an avid athlete. He belonged to the field hockey team during his years at prestigious Keio University, and represented Japan at the Asian Games. His love for sports hasn’t changed since Toyoda became company president. A year ago, the sports world became Toyota Motor’s dominant platform. The company’s athletes won numerous national competitions in various sports. Every time they won, Toyoda was seen on the site sharing their joy. But Toyota is no exception when it comes to companies fighting a tight budget. The company posted a consolidated operating loss of 461 billion yen in the fiscal year ending March 2009, soon after the rapid global economic decline triggered by the 2008 collapse of Lehman Brothers. That was the first loss Toyota had booked in 71 years. Despite these challenges, the company has not discontinued a single sports team or club for financial reasons. Group firms, which are inadvertently affected by the parent company’s earnings, haven’t either. Toyota Motor continues to highly value sports, boosting employee morale and giving them a sense of belonging. In sharp contrast to Toyota Motor, Japanese corporate sports teams have been drastically dropping in number over the past few decades. During Japan’s rapid economic growth , many corporate sports teams sprung up as special benefits for employees or as sources of advertising. But corporate sports have been declining amid the prolonged economic decline triggered by the collapse of the asset-inflated bubble economy. The financial turmoil following the collapse of Lehman Brothers accelerated this trend. In 2009, the Nissan Motor Co. shut down many of its sports clubs, including its prestigious baseball team and table tennis club. NEC Corp., which helped train many of Japan’s best athletes, had to discontinue its men’s volleyball club. Because other companies are pulling out of sports from late 1950s to the early '70s, Toyota group firms now make up three of the eight teams competing in the W League, Japan's top women's basketball league. Toyota group firms also comprise three of the eight teams competing in the Japan Handball League for men. Toyota Motor is also increasing its influence over the sports industry. In April, Toyota Motor Corp. Chairman Fujio Cho was appointed chairman of the Japan Sports Association (JASA), which oversees and manages numerous sports organizations. According to Cho, the previous JASA chairman, former Prime Minister Yoshiro Mori, personally asked Cho to take over the post. Considering Toyota Motor’s abundant supply of athletes and financial support for their training, it is fair to say that the Japanese sports industry relies heavily on Toyota’s presence, especially at a time when other private-sector firms are getting out of the game. By supporting top athletes who make a difference in the world, we plan to strengthen the unifying force of our overseas businesses,” says Toshiyuki Nonaka, Toyota's head of human resources in charge of sports.